"[My father] believed I was wasting my time," Gebrselassie recalled. "For him, sport was fun and nothing else - you could not make a living from it." - Even Haile Gebrselassie had to convince his parents to let him follow his dreams of becoming a runner. Haile will be in New York City this weekend to star in the NYC Half Marathon. Coming Thursday LRC Track Talk #6 With Craig Virgin (8pm EST) The two-time world cross country champion and two-time American record holder will be our featured guest and will talk about his amazing career that spanned from the best time in American history (the 1970s when we had the likes of Steve Prefontaine and Frank Shorter) to the absolute nadir (the 1990s). Email us your questions ahead of time. LRC The Week That Was Last week was an amazing one for track and field fans, as you had World Indoors and NCAAs taking place on the same days. We're not going to recap the meet again, but instead we talk about interesting tidbits like new world-record-holder in the 1,000m heptathlon - Curtis Beach, unheralded "world champions" from the NCAA meet, -200 degrees performance-enhancing cryotherapy chambers, the drug-free L.A. marathon (as in you're free to use drugs), and our performance of the week ... and it's not by who you think it is. South African Athletics Rep: Qatar "Becoming More Westernized" By Accepting Female Athletes, Female Spectators At Major Sporting Event Interesting observation. Charles van Commenee Huffing And Puffing About British Failure In Doha - Will Raise Qualification Standards They King Charles wanted 5 medals and got 4. <<<Paper: Ethiopians Net A Goal On Kenyans At World Indoors The Kenyans had the upper hand last summer in Berlin but are not happy to see Ethiopians score a bunch of distance golds in Doha (Kenya didn't win a single event). *Tough To Win All The Time: Isinbayeva May Take A Break Notice in the press that Isinbayeva "failed" and "lost" and "blew it" in Doha. When you're expected to win all the time, the sport can become terribly hard to deal with. 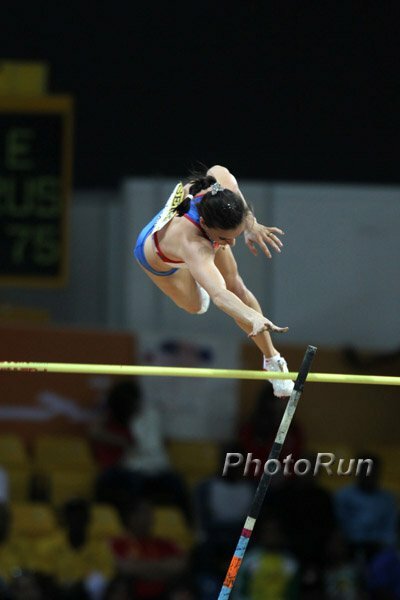 Left is a photo of an attempt that Isinbayeva failed despite clearing the bar by about 2 feet. *Good Interview With Blanka Vlašić Vlašić, who sooner or later will get the HJ world record, has put together some clutch performances after being seen as a "choker" at major championships. *London, Beijing And Poland Bid For 2015 Outdoor Worlds New York City (NYRR) is trying to get the half marathon champs to the US in 2012. *IAAF Organizers Of 2011 Worlds In Daegu Announce Plans To Get People Excited About Track The plans sound totally ridiculous (announcing the mascot is one of the 3 points). Not to be whiny, but how about having the meet on our side of the planet? *All-Athletics Lists Formula-Based Top 10 Performances For Males And Females From Doha Jessica Ennis #1 female, Teddy Tamgho #1 male. *Over-Confident Isinbayeva Contemplating Time Off When you're the world athlete of the decade, you are ridiculed every time you lose. Take a vacation and come back and break the world record. *Aggressive Jenny Meadows Beaten By Savinova, Who Ran 52.0 This Season Meadows has now lowered Kelly Holmes' indoor record twice and medaled at Worlds twice. Athletics Kenya - Chill Out! Jamaica Not Worried About Only 2 Worlds Medals ... because they're not worried about indoors. This is the team everybody was saying is better than the US just a few months ago. Kenya Athletics Boss Irate With Kenyan Peformance At Worlds AK bosses as usual are over-reacting. Kenya could only afford to send 6 athletes to Doha, they still came back with 4 medals, and the organization is talking about changing the whole system and taking more control over the athletes. Ted Williams is the only man in over 50 years to bat .400 and the Kenyans aren't happy with batting .667. LRC Men's Day 2: Deja Vu For Wheating, Andrews And Emanuel Saturday was a day for the history buffs, as Andrew Wheating's indoor frustration continued, Robby Andrews' unbeaten streak continued, Lee Emanuel again dominated the mile ... and then there was Dorian Ulrey making history with his first NCAA title. Hats off to the team champions, the speedy Florida Gators, who won fairly easily over Oregon. LRC Women's Day 2: Favorites & Big Names Shine As Bizzarri And Koll Battle In Epic 3k The favorites earned dominant victories in the 800 and 1,500, but the most anticipated matchup of the night was in the 3k, where Lisa Koll and Angela Bizzarri put on a great show. Oregon's dominant team victory and an American record in the 400 shouldn't be forgotten either. More: *Francena McCorory Of Hampton Sets US 400m Record In Winning NCAAs From a nobody HS record-holder to a US record holder! *Duck Women Win Oregon's First Female NCAA Team Title In Any Sport Since 1987 Quotes from Vin Lananna after Ducks were down after Day 1. *Boards: Mo Trafeh, Katie McGregor Win Gate River Run According to the boards, Mo Trafeh took the first mile out in 4:16 (USATF says 4:22) and never looked back en route to a studly sub-43 clocking on the 15km course in Jacksonville. Tim Nelson was runner-up for 2nd year in a row while Jen Rhines was #2 on the women's side. LRC Day 3 Photos From Worlds 4 x 4 photos, Women's 800, 1,500; Men's Triple Jump, 60h, 3,000, more. 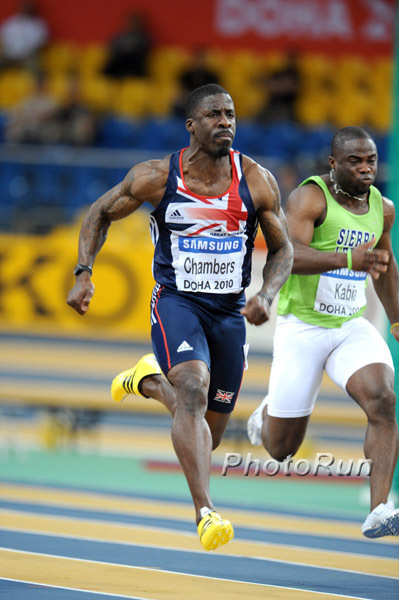 *LRC Day 1 Photos From Doha Preliminary rounds: see most of the Americans in action. *New All LRC 2010 Photo Galleries Displayed Here PhotoRun's photos are usually our favorite visual treat of the week. Story Of How Haile Turned Down His Father's Wishes To Become A Runner - Haile Runs In NY This Weekend Who doesn't love the Haile G story? See him compete in New York this weekend in the NYC Half Marathon against some of the US best (though Meb Keflezighi had to pull out). 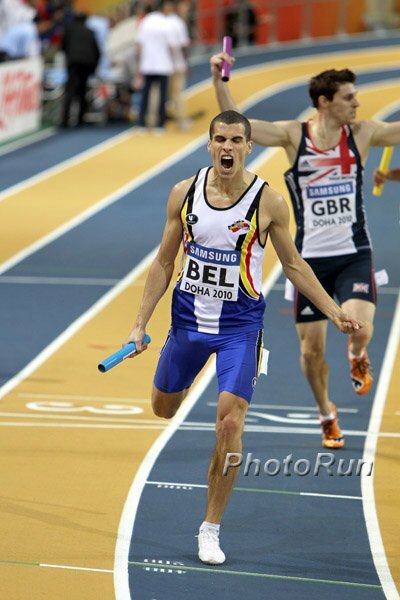 Ruben Ramolefi Hopes To Break South African Steeple Record A little press for a steepler pushing the limits. Also: LA Marathon Is Sunday (Link to our Week That Was where we talk about the LA Marathon) We love the Wesley Korir story but don't like that L.A. has no drug testing. Robby Andrews' Win Gets Nice Article From NJ.com When you're undefeated and you beat an Olympian at NCAAs in your freshman year, you get your own section on LetsRun.com for a day ... Vig, don't let it go to his head. *LRC LetsRun.com's Take On Robby Andrews/Andrew Wheating Duel We Employee #1 predicted the Andrews win. 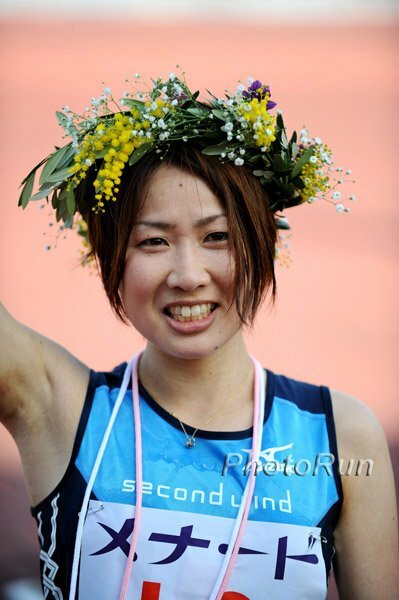 *More Yuri Kano Defeates NYC Marathon Champ Derartu Tulu At Nagoya 2:27 To 2:28 Kano fell in New York last year when Tulu upset Paula Radcliffe. *Results From Japanese University Half Marathon Champs It took 63:30 to get top 8. Both NCAA Mile Champs Hail From Britain Charlotte Browning (UFlorida) and Lee Emanuel (UNM) have both come to the US and thrived. HSer Alex Hatz "Becoming Absolute Running Machine" Nice article from Syracuse newspaper on Alex Hatz's negative-split 4:05 mile win in Boston this weekend over Kirubel Erassa (left). Hatz broke Alan Webb's meet record, ran the 3rd-best US time ever, and also broke John Trautmann's 24-year-old New York State indoor mile record. Hatz is going to Wisconsin. *More: Alex Hatz Breaks Alan Webb's Meet Record At NIN Mile Also a mention should go to Emily Lipari, who won a tough girls' mile in 4:42, one of the fastest-ever prep indoor times. 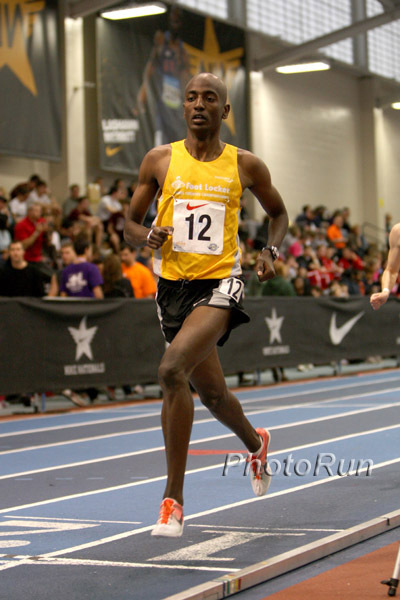 *Earlier Update From Nike Indoor Nationals In Boston Kirubel Erassa of Georgia runs 14:19 for 5,000m. LRC Lagat Is Utterly Brilliant In Men's 3k As Johnson Earns Bronze In Women's 800 - Day 3 Recap Bernard Lagat put on a clinic in the men's 3,000. 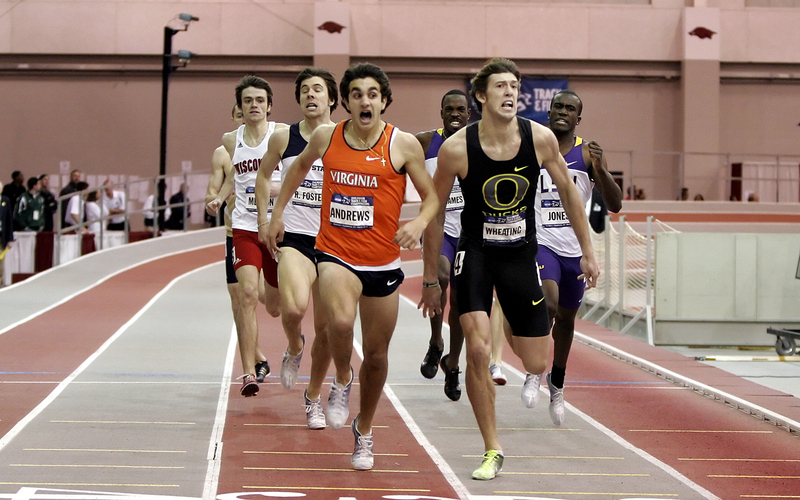 No one came close to touching him thanks to a sub-4 final 1,600 and 2:25 final 1k. In other action, Alysia Johnson earned a surprise bronze in the 800, Abubaker Kaki defended his crown and an 18-year-old may have ended Jordan Hasay and Steph Twell mania for eternity by winning the women's 1,500. More From Lagat: Bernard Lagat On Why He Did So Well In 3,000 Lagat credits the team and USATF: "This is the best team I've ever been on." *Quotes From US Team After Final Day In Doha The US won almost a third of the gold medals awarded at the meet and were by far the best team there. When Usain Bolt isn't at the meet, the US team looks unbelievable.